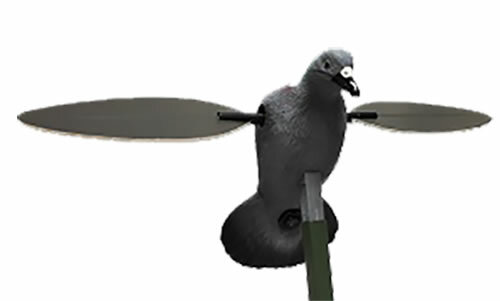 The Mojo Pigeon is a realistic simulation of a landing Wood Pigeon that features a realistic body with the standard Mojo Mounting Peg and direct drive motor with magnetically connected wings. It operates up to 16 hours on 4-AA batteries (not included) and comes equipped with a new heavy-duty on/off switch. It is complete with 3-piece metal mounting pole.